Trying to get into DJing but on a budget? 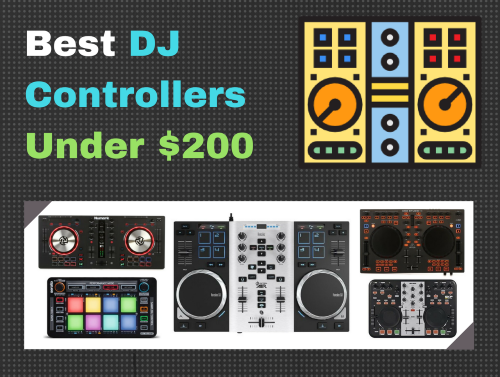 Let’s take a look at some of the best DJ controllers under $200 available on the market. Quick Answer: If you’re looking for the top choice, the Numark Mixtrack 3 is the one to get. But if you’re looking for the best for the cheapest price, take a look at the SKP Pro Audio SMX-800. In the rest of this post we’ll cover a few more options, as well as go over the basic features and specs of these DJ controllers. As modern technology advances, music and audio production equipment continues to become easier and easier to use. With more and more tweaks and adjustments, musicians are able to work their magic with much less pieces of equipment. Not so long ago, DJs had to use turn tables, mixers, vinyl records, and more just for a live performance. Now, all you need is a DJ controller, a laptop or computer, and some speakers. A DJ controller is basically a combination of a mixer and a turntable. Bulky vinyl records that have to be changed for every song have been replaced with smaller disks with about half the diameter. Nowadays a DJ can change songs, tracks, clips, audio bits, etc. with just a click of their mouse or keyboard. DJ controllers also have many knobs and buttons that allow the user to adjust bass, frequencies, volume, and more. Most DJ controllers use USB cables to connect straight to the laptop or computer for nearly instant access. With every knob movement, button push, or disk spin, a signal is sent from the DJ controller to the laptop or computer. These signals process in the laptop or computer and come out of the speakers as sound. The more speakers the better, as you’ll need a higher sound output for live performances. Loud crowds need to hear the music, so you should invest in decent quality speakers that can be heard over them. Live performances have become much less of a hassle for modern DJs, which encourages more amateurs to test the ropes. Get your DJ controller, some speakers, and a decent laptop. Don’t settle for cheap, low-quality equipment or you’ll be swept under the rug. Find out what you can do to stand out from the rest, and get started. *Street price. This means that while the general price for these controllers will remain under $200 at most places, Amazon holds the right to change them at any time. The Numark Mixtrack 3 is widely known as one of the most user-friendly DJ controllers at a very affordable price. It even comes with its own software, all you need is a laptop or an audio interface and some speakers. It’s USB compatible, which makes it usable with nearly any laptop or computer on the market. The Numark Mixtrack 3 speaks for itself in the hundreds of positive reviews. Buyers love the easy-to-use interface and all the extra features included that most DJ controllers in its price range don’t have. It’s one of the most widely purchased DJ controllers in the range. The only true cons to this controller is the software that comes with it. Customers complain that it’s slow, with a limited amount of adjustments. That being said, you should invest in a higher quality DAW for your audio productions. What do you expect from free software? You get what you pay for, and the rest of the Numark Mixtrack 3 is a steal for its price. The Behringer CMD Studio 4A offers a unique array of features that many of its competitors don’t have. For starters, it offers an on board audio interface. Why shovel out the cash for an audio interface if your DJ controller comes with it? Unless, of course, you have more than just a DJ controller, but that’s a different topic. Touch screen keys mixed with its low-profile design both make the Behringer CMD Studio 4A a strong competitor for a low-budget DJ controller. 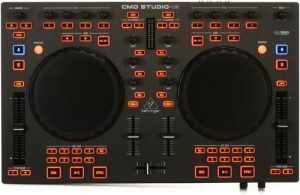 The Behringer CMD Studio 4A is a high contender for the best DJ controller under $200 without a doubt. The simple fact that it contains its own audio interface makes it far ahead of its time. Consumers are crazy about it, saying that the controller is better than others that cost over $350. The only complaints consist of customers concerned with seller information, and mishandling of the product from third-party salespeople. If you’re looking for a DJ controller that fits all of your needs, the Behringer CMD Studio 4A just might be the perfect fit for you. The Reloop Neon probably has the most unique design on the list. Multi-colored functional squares decorate this DJ controller, which makes it one of a kind. You can connect two controllers together, which is another unique feature. It’s incredible user-friendly since everything is boldly labeled with large font. It’s hard to make any mistakes on the Reloop Neon, and the company makes sure of it in their design. The Reloop Neon is a small, less heard of DJ controller that packs a punch for its size. Although it’s not as common as the other controllers on the list, it certainly gives you a run for its money. Combine two Reloop Neons to make the ultimate DJ controller with maximum functions. Customers love the Reloop Neon, with almost zero negative reviews and plenty to back its true value. Why not ditch the old turntable and give modern technology a try? The Reloop Neon is the perfect match for DJs young and old to get started or continue to produce quality music. The Hercules DJControl Air S is quite possibly the most technologically advanced DJ controller on the list. It features USB compatibility, a touch pad, and pressure-powered jog wheels. Although it might not be as exciting to look at as the other controllers on the list, it definitely deserves its place. 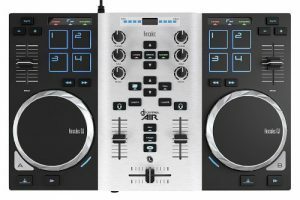 The Hercules DJControl Air S is one of the best DJ controllers for anyone looking to break into the production scene, or any beginner looking to step their game up. All you need is some headphones/speakers and a laptop or a computer and you’re all set. The only real cons that reviewers complained about were the size and the audio output. The Hercules DJControl Air S might not be the best option for you if you want to do live performances in front of huge audiences, which is why it’s a little lower on the list. Other than those concerns, this controller is well worth the money. 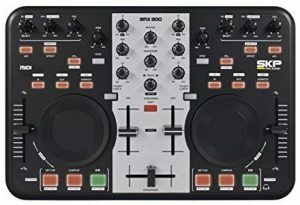 The SKP Pro Audio SMX-800 is the cheapest on the list, which obviously means that it doesn’t have all the futuristic designs and features of the other DJ controllers on the list. That being said, this controller offers several cool functions that make it worth the look. The price doesn’t hurt either if you’re on a budget. The SKP Pro Audio SMX-800 is a great entry level DJ controller for a music producer on a budget. Although you don’t get all the fancy bells and whistles of the other more expensive DJ controllers, you still get the essentials (which is all you really need). Reviewers actually love the simple design. A small learning curve is actually a huge benefit of this controller, since you don’t have to learn all the special details of more costly controllers. If you’re looking for a bare bones, easy to learn DJ controller, the SKP Pro Audio SMX-800 is your best bet on the list. DJ controllers offer several unique features between each of them, so don’t get caught up with all the information. If you’re looking for a top of the line DJ controller for under $200, the Numark Mixtrack 3 is without a doubt your best option. It contains a bunch of really cool features, but most importantly it’s incredibly reliable. If you want a basic starter controller, or you just don’t want all the fancy extras and have a low budget, the SKP Pro Audio SMX-800 is for you. Although you don’t get a super cool looking controller board, you get a decent model with great reviews. 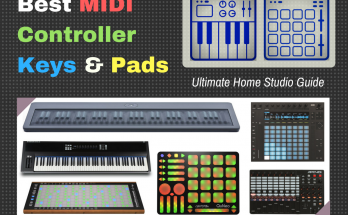 All in all, DJ controllers are excellent tools to expand your audio production repertoire. If you’re looking to be a DJ in live performances, you’re going to have to get a DJ controller at some point, so try out one of the controllers on the list to see what fits best for you. 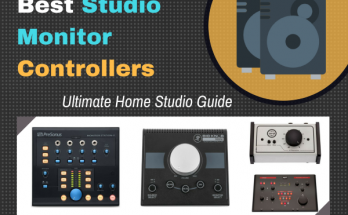 Maybe you want two controllers to connect like with the Reloop Neon, or maybe you want a futuristic design as with the Hercules DJController Air S. Jot down whatever it is you need, and compare it to this list to find the perfect DJ controller for you.